Chamonix, Last Day in Annecy, & Drive to Dordogne! It was kind of strange to spend the 4th sans fireworks or celebration. 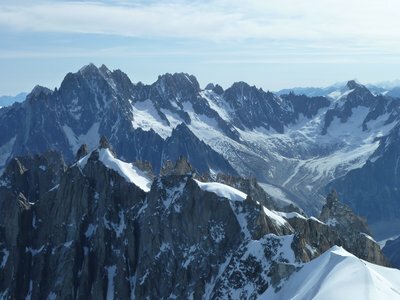 We managed to see some pretty extreme and awesome scenery in the alps! 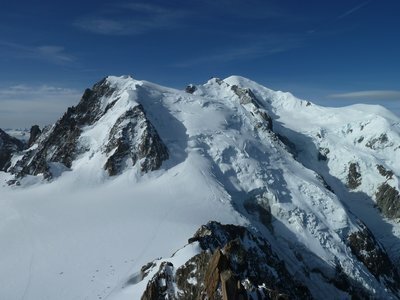 We were lucky enough to score big with great weather in Chamonix, France. We got up early in Annecy and made the hour+ drive to Chamonix. We had pre-purchased all-day passes to ride as many gondolas/trains/lifts as we could. The kids were pretty cranky in the morning but nothing could spoil this view. 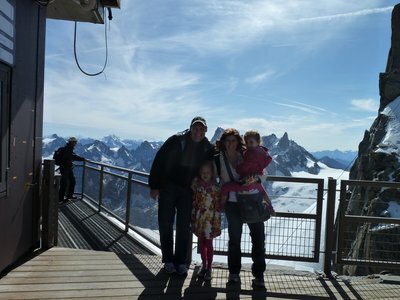 We took the biggest and best gondola ride up to the Aiguille du Midi to have a close up view of the biggest mountain in Europe - Mt. Blanc. 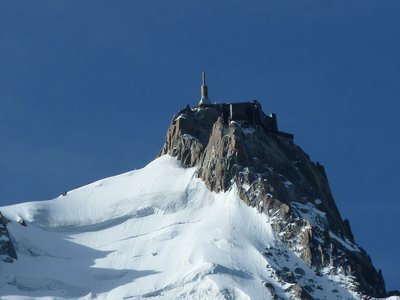 The structure at the top of the mountain is truly remarkable. 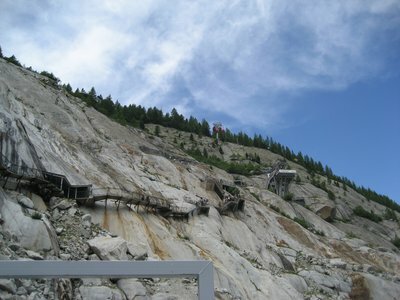 After our two gondola rides, we took an elevator up to the top of a rock. Ridiculously beautiful. Enough said. We took tons of pictures. I'm only showing a few mostly because downloading them is taking. so. long. After seeing Mt. Blanc up close and personal, we took a cog-wheel train to Montenvers (Mer de Glace). 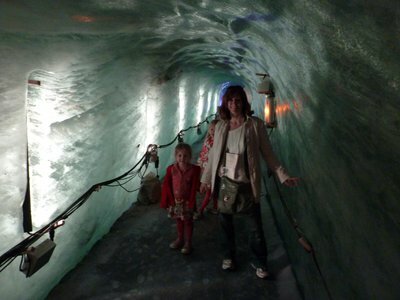 We were able to see - and walk through - a real glacier! 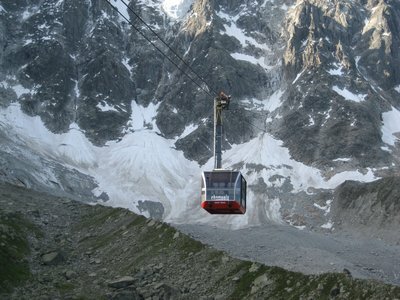 Once we got off the train, we took a small gondola down to the entrance to the glacier. 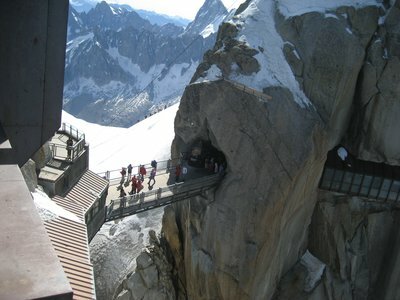 Sadly, the glacier continues to melt each year and the number of steps to reach the ice tunnel increases each year. 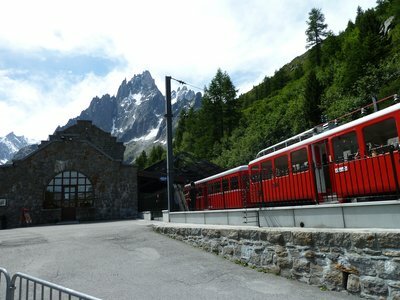 After our train ride, we found a nice outdoor restaurant in Chamonix where we refueled. The girls were completely worn out by this point. 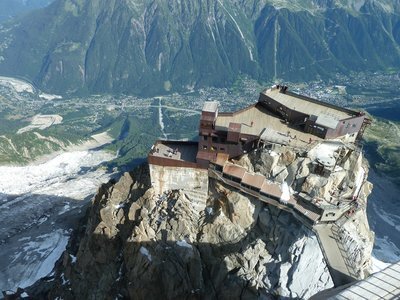 DH was kind enough to wait in the car while I rode a small gondola up to the top of Le Brevent for one last view. What a great day we had! 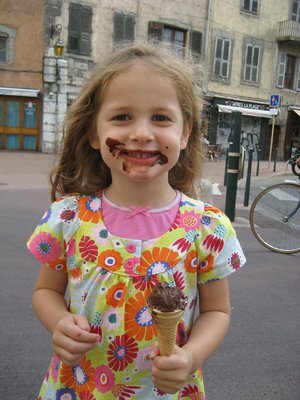 We arrived back to Annecy in time for more gelato and crepes for dinner. I began our last HOT day in Annecy with a short run. I was happy to see that another market was getting started! 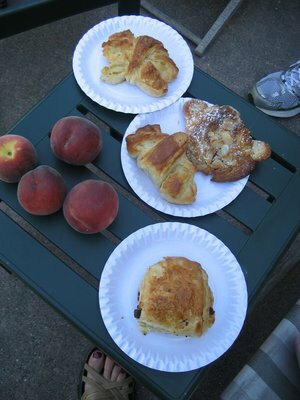 DD#2 and I set out to gather peaches and pastries for breakfast. We took a drive up Le Semnoz to a pretty but distant view of the mounains we'd seen yesterday. 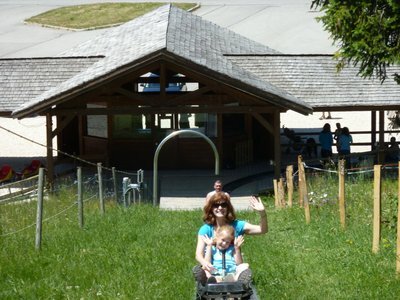 After the kids played on a playground at the top of the hill, we spotted another summer luge. It was closed for lunch so we settled in at a ski resort and had wine and cheese while the kids played. The best part were the cows roaming beneath the chair lifts. Many wore cowbells and it was music to my ears! 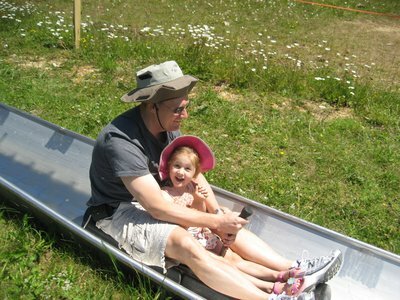 This luge was even better than the one in Germany. There were fewer people and the price was better. We each had three very fast runs! We made our way back and had another final round of gelato. We were sad to leave many flavors untasted! After lots of hunting for dinner, we settled on a cafe where DH had a croque monsieur and I had a salad nicoise. 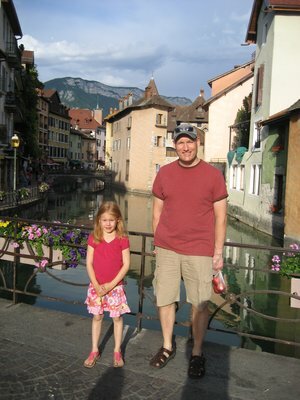 Annecy was lovely but a little touristy for our tastes. We were pretty hot our last night and some loud teenagers were outside our room until late. The location of the hotel was great but the traffic getting there was difficult. 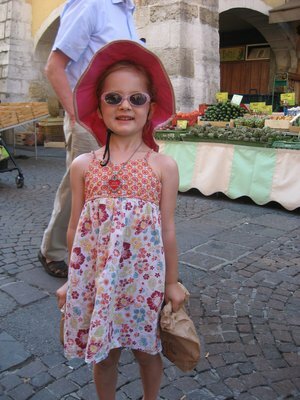 Overall, Annecy would have been better as a 2-3 night stop rather than 4. DD#1 had quite a fever at one point. Luckily, the pharmacy had Children's Advil and her fever broke. She's feeling much better now. This is the shortest entry of all. We left Annecy after another breakfast of croissants. Mmmmmmmm! The 6 hour drive took us through central France and was quite uneventful. I drove over two hours and enjoyed going 80-90mph on the autoroutes! Woohoo! Too bad the tolls were so crazy expensive. 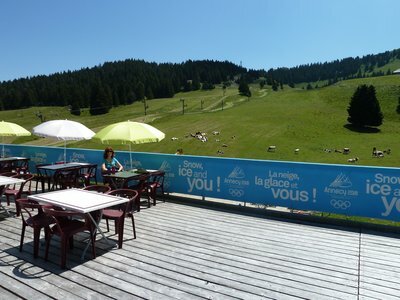 We arrived at Le Chevrefeuille Chambres d'hotes (b&b) and loved the buildings and outdoor areas. The Dordogne region was already fascinating with its narrow winding roads, ancient looking buildings, and rustic appeal. The pool wasn't too shabby either. We stopped at a Carrefour grocery store and stocked up. We finally had a shared kitchen facility and could keep perishables. We had a nice picnic dinner by the pool and had a short swim before bed. I was also able to do some laundry and hang it to dry. The kids liked helping me hang the clothes on the outdoor clothes lines. We don't do that at home but should! Random observation - many children use pacifiers well past toddler-hood. I saw one kid who had to be 5 walking around with a pacifier in her mouth. Several 3 and 4 year olds too.